Anyone else wake up Wednesday morning thinking, 'It's only Wednesday?!?'. If you did, you weren't alone! Persistent cloud cover combined with off and on rain showers have made for a very LONG week, but I've got some good news - brighter days are ahead! It just will take a wee bit longer to get there. A strong blocking pattern is to blame for the cloud cover and cooler air here and the severe weather outbreak in the south. High pressure over Canada hasn't allowed much movement for storm systems within the jet stream. This has kept a large and strong upper level low parked over much of the middle of the country. While it has slowly shifted to the east closer to the Great Lakes each day, the effects of the slow movement have been felt in the Midwest with cloudy and cool days while Gulf moisture continues to run into the strong winds in the jet stream in the south and southeast. Over the next couple of days, the high in Canada will weaken and begin to move northeast which will allow everything that's been 'backed up', so to speak, to move with it. A west to east wind (otherwise known as zonal flow) will be present over the weekend allowing a slight moderation in temperatures by Saturday and Sunday. We'll still be below average, but at least we won't be as far below average as we have been. By next week, developing low pressure in the west will push the jet stream back north over the Midwest and Great Lakes getting our temperatures closer to average; which by that time should be in the upper 60's to low 70's. So, hang in there. It does get better, it's just going to take some time. If it didn't feel like it before, severe weather season is officially here as the Stateline saw its first Tornado Warning of the year on Tuesday. According to a local emergency manager, the tornado briefly touched down near Shannon Tuesday morning. No damage was reported. The storm also triggered a Tornado Warning for most of Stephenson County around lunchtime, but once again, nothing major to report. The greatest instability within the atmosphere has remained down south and that's where it's going to stay for the next couple of days. However, we have had a few storms roll through as low pressure spins in the middle of the country. Low pressure currently southwest of the Quad Cites will lift a warm front into northeast Illinois over the next couple of hours with temperatures rising into the low 60's. North and northwest of the front clouds will keep temperatures in the 50's during the afternoon. While scattered showers are almost a sure bet in northern Illinois and southern Wisconsin, thunderstorms will also be possible as the upper low swings through later today. Temperatures usually decrease with height and the colder the temperature is above the surface, the stronger the lapse rate will be. Lapse rate is simply a change in temperature with height. The greater the difference, the steeper the lapse rate. This is just one, of many, factors in developing thunderstorms. Clouds have thinned out mainly south and east of Rockford as drier air wraps in around the low. This clearing will allow surface temperatures to rise into the low 60's. As the colder upper level low moves over the relatively warmer surface, the air will quickly rise causing it to become unstable and generate thunderstorms. If those storms were to form, hail would be the primary threat. 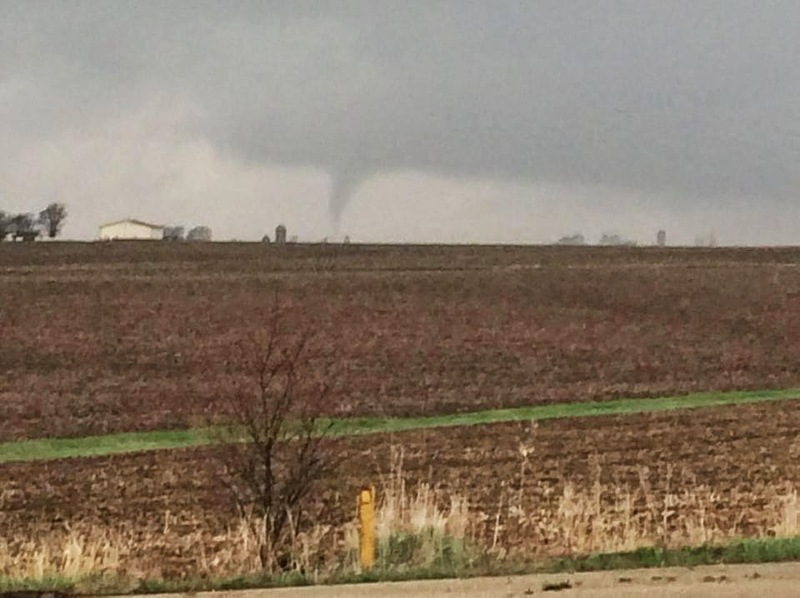 However, a few funnels have been reported in eastern Iowa and there was a report of a brief tornado in Shannon (Carroll County). Any storms that do develop will have the possibility of hail and could also begin to rotate being close to the low pressure system. Storms would then decrease in coverage once the sun sets this evening with just showers lingering into the overnight. This low pressure system will continue to weaken and move into the eastern Great Lakes by the end of the week. Even though we'll see a daily chance for rain it will decrease in coverage the closer we get towards the weekend. 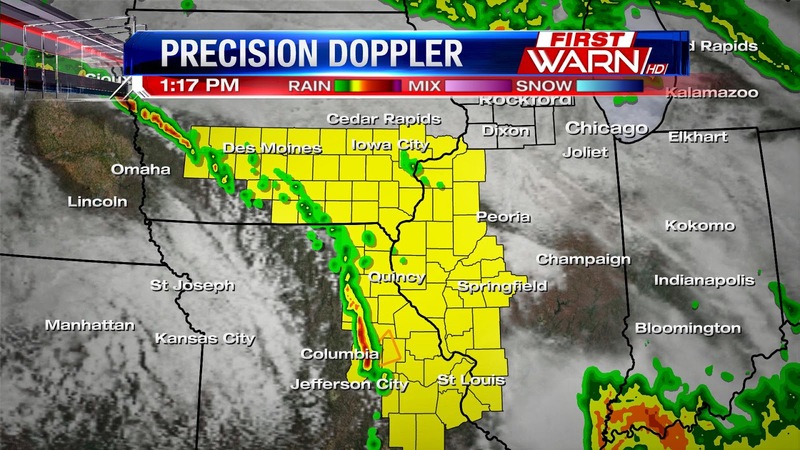 Tornado Watch issued for parts of Iowa, western Illinois and eastern Missouri until 7pm. 1:05am Update: Clearing in Missouri along with building instability has caused a few thunderstorms to develop northeast of Columbia, MO. These were right along and south of the surface warm front which has stayed pretty much in place through the morning and early afternoon. Thunderstorms also are forming closer to the surface low near the Iowa and Nebraska border north of Omaha. There, stronger shear could promote a few tornadoes. 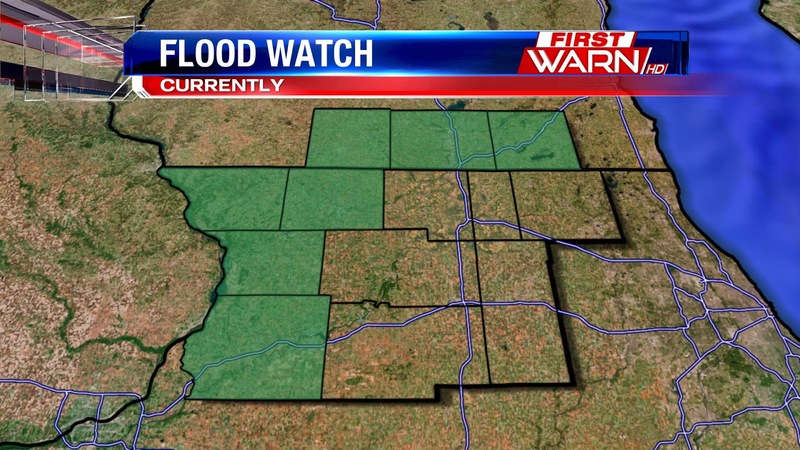 A weather watch will likely be issued for parts of Missouri, Iowa and west-central Illinois very soon. After Sunday's devastating tornadoes that killed over 12 people, the south is gearing up once again for another active day. Ongoing storms in parts of Tennessee, Kentucky and further south have already produced numerous severe thunderstorm warnings and even tornado warnings Monday morning. The greatest threat for severe weather will remain over parts of Mississippi, Alabama and Tennessee later today, but the threat does extend further north into central and northern Illinois. Most models indicate the highest instability will remain well south of the Stateline as thunderstorms from this morning have somewhat disrupted the flow of moisture from the Gulf. However, clearing has begun to take place over Missouri and west-central Illinois late this morning and this area could become the focal point for thunderstorm redevelopment early this afternoon as surface low pressure strengthens and spins into Iowa. 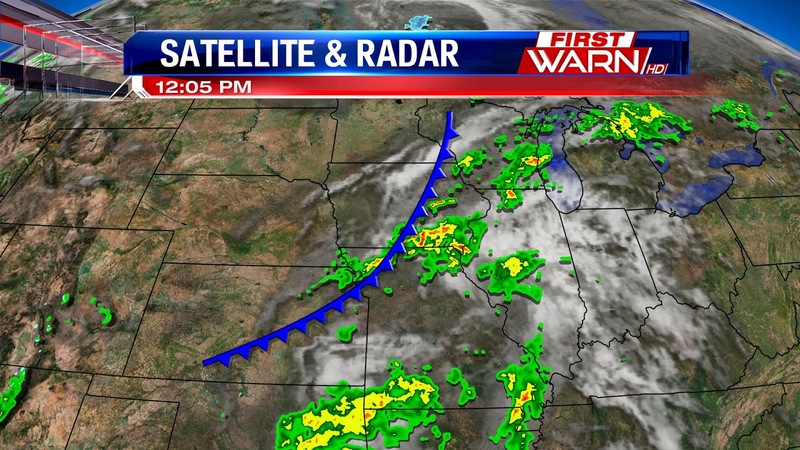 A warm front sits from eastern Nebraska southeast through Iowa and into central Illinois. North of the front clouds, east winds and morning rain has kept the atmosphere pretty stable and is expected to do so through the majority of the early afternoon. South of the boundary, instability is slowly starting to build as upper level disturbances wrap around the surface low. 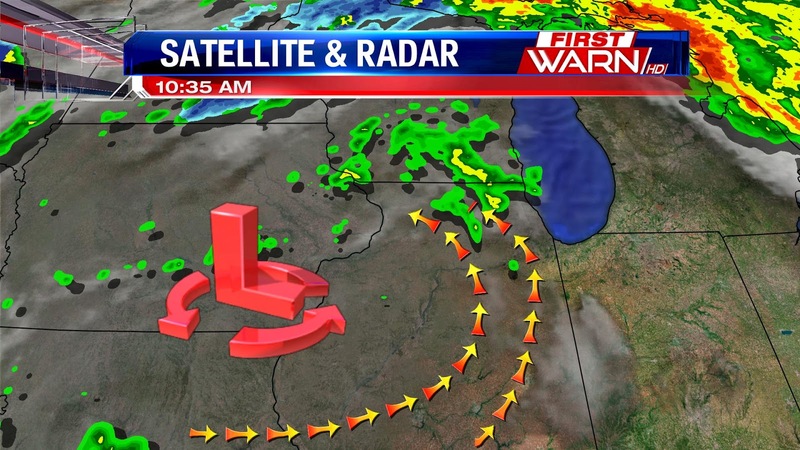 The disturbances will try to pull the warm front further north through the afternoon which could allow storms to creep back in after 4pm into northern Illinois. While the chance of severe weather remains low, if the front were to slide close to I-88 the storm threat would increase with hail and damaging winds. Of lesser concern would be a tornado threat, but enough wind shear near the surface warm front could cause a few isolated tornadoes to develop. 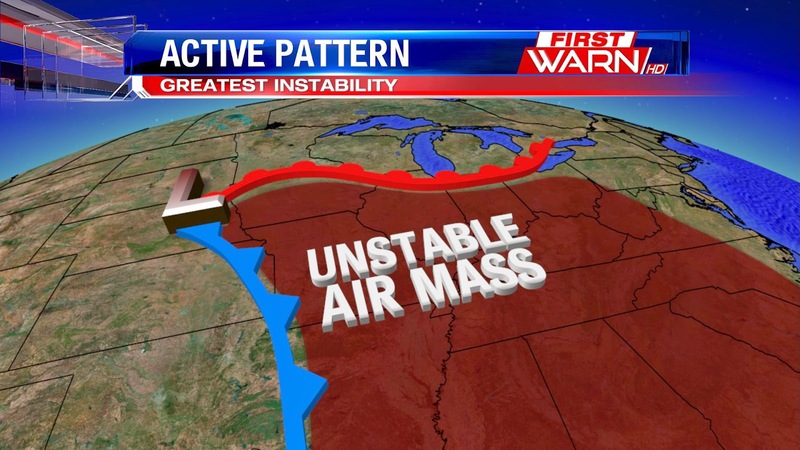 We'll be watching closely the development of the front and just how much instability can build during the day. The greatest concern for severe weather will stay south as another potentially dangerous day could unfold through the south. Be sure to stay with the First Warn Weather Team for both local and national weather updates. The quiet beginning to severe weather season could soon be coming to an end beginning late Saturday night. A strong, but slow moving, storm system will have much of the U.S. under its control through the end of this upcoming week. Low pressure will rapidly strengthen in Nebraska late Saturday night and Sunday pulling in a fairly unstable air mass south of a warm front putting places like Iowa, central Illinois, Missouri, Arkansas, eastern Oklahoma and Texas under a severe weather threat Sunday afternoon. That threat will then shift slightly east Monday as the greatest instability follows the strongest part of the jet stream. Closer to home, thunderstorms and heavy rain will be likely Sunday night and Monday afternoon as the warm front lies between the I-88 and I-80 corridor. We will, however, have to watch just how far north the warm front is able to reach. If it can reach a little further into northern Illinois then the strong to severe storm threat will shift further north with it. If, however, the front stays to the south, east winds off of Lake Michigan will provide a drier and more stable air mass keeping a lot of the severe weather at bay. As the old saying goes: 'The devil is in the details' and that's surely the case with this next storm system. While the greatest severe weather threat will stay south of here, it'll be close enough late Sunday and Monday. Make sure you stay alert over the next couple of days. As far as rainfall, the Gulf will be wide open for moisture to lift north through the Mississippi River Valley leading to potentially over two inches of rain falling from Sunday through Tuesday in northern Illinois and southern Wisconsin. With this expected rainfall, area rivers and streams could see a rise in levels by the middle of the week. If you live near an area that does experience flooding, make sure you remain alert to any rising water levels on those rivers. Thursday night's rain is just a drop in the bucket compared to what we're expecting next week. Friday and Saturday will be the only two days in the upcoming forecast with no rain chances, so get out and enjoy them. 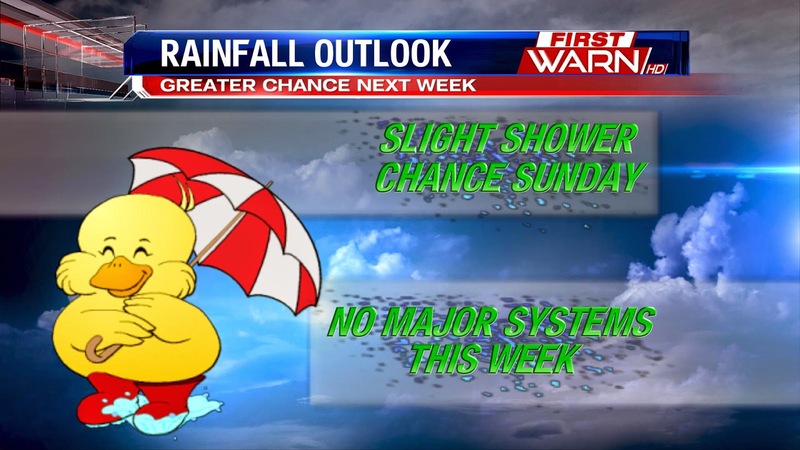 Rain chances begin Sunday and look to continue through most of next week. The culprit for all this rain is an extremely slow moving low pressure system that will gradually pass to our south over the course of next week. 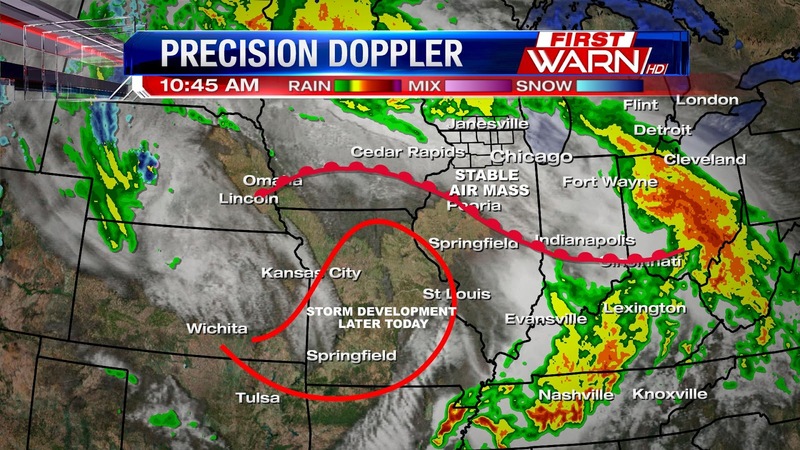 This system could drop several inches of rain on the Stateline, all while keeping highs mired in the 50s. A Frost Advisory remains in effect for Northern Illinois through 7am Wednesday morning. Temperatures early this morning have fallen into the upper 20's in a few outlying areas. Clear skies and light winds overnight have allowed those temperatures to fall below freezing early this morning. Once the sun comes up, temperatures will rise into the upper 30's bringing the end to the threat for frost. With the warmer weather over the past several days you may have been itching to get out and do a little spring planting. But talk to any avid gardener or planter and they'll tell you to wait just a little longer. That's because temperatures, even at the end of April and beginning of May, can still drop below 32 degrees. And with this spring off to such a late start, I wouldn't be surprised if we do have a few more colder nights ahead. Tonight temperatures could fall into the low 30's. Looking over the past 30 years, 1981-2010, the median time frame of when the last 32 degrees typically occurs in Northern Illinois is within the last week of the month: April 21st - April 30th. However, the latest freeze did occur on May 27th one year! A hard freeze is when the temperature drops to 28 degrees or below, also known as a 'killing freeze', and that's usually experienced about a week or two earlier. But again, colder nights can still be found in May when a cold night May 7th one year dropped the temperature below 28 degrees. While many flowers have already sprung up in your yard or garden, you will want to wait just a bit longer before heading to the store to buy those annuals. The Belvidere Tornado of April 21st, 1967 is still known today as one of the worst tornadoes to hit the Stateline. The tornado touched down in nearby Cherry Valley before moving through the City of Murals around 3:40pm as an F4, packing winds estimated at 240mph. Twenty-four people were killed and around 500 were injured because of the storm. 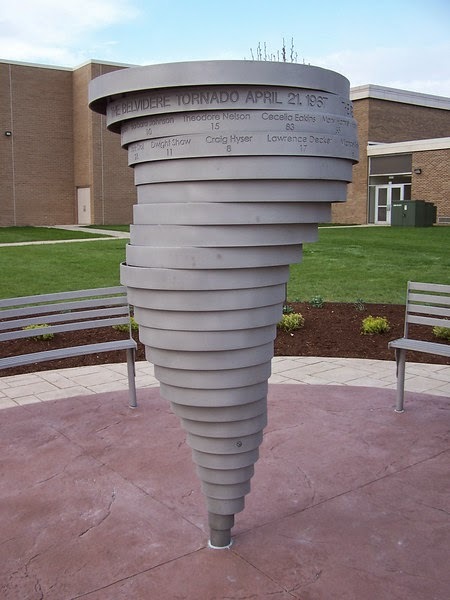 Thirteen deaths occurred at Belvidere High School, making it the sixth worst death toll at a school from a tornado. A memorial has since been built at the high school to honor those killed by the storm. There are 25 rings on the memorial: Twenty-four to represent those who died and one extra ring to honor all those impacted by the tornado. 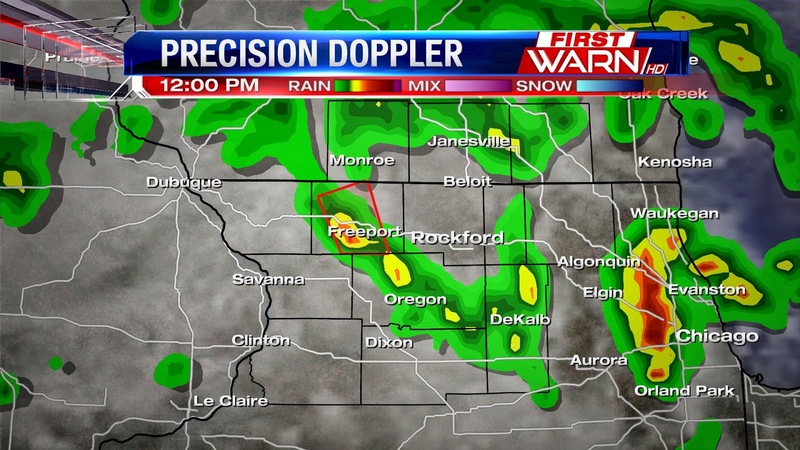 Rain moving into Rockford as of Noon will hold temperatures down a bit this afternoon. We've made it into the upper 60's, but likely won't rise much once this first round of rain moves out. Additional showers and thunderstorms are expected after 2pm along and ahead of a cold front that will sweep through late this afternoon. Instability will remain low due to a lack of support in the upper levels of the atmosphere, but there will remain enough moisture and lift ahead of the front to get a few thunderstorms to roll through later today. Rainfall won't amount to much, unless you're under a thunderstorm, with totals right around a quarter of an inch. The cold front will pass after 7pm bringing an end to any rain with skies clearing out after midnight. High pressure will settle in Tuesday bringing back the sunshine with slightly cooler temperatures right around 60 degrees. Easter was not only beautiful for the Stateline, it was almost record breaking! As of 5:40pm, the official high in Rockford was sitting at 80°. This is not only the first time we've seen 80° on Easter since 1987, but the second warmest Easter on record for the Forest City! Whether you have an Easter egg hunt planned or an outdoor picnic, your weekend plans should go off without a hitch. Temperatures will rise into the middle 60s on Saturday and into the low 70s on Sunday. 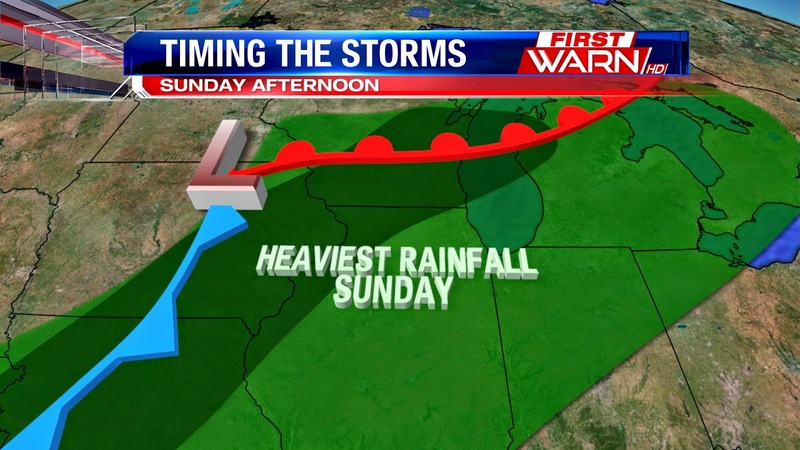 A cold front will stay mainly northwest of Illinois Sunday afternoon which will keep the majority of rain back into Wisconsin and Iowa. The chance for rain will increase once the sun sets Sunday evening, but for a good chunk of the day we will stay dry. The drier weather means temperatures have a good chance of reaching the low 70s; assuming skies don't cloud up much into the afternoon. The threat for rain will increase Sunday night as the warm front moves closer, but at this point it doesn't look like a lot of rain will fall between Sunday night and Monday afternoon. So make sure you get out there an enjoy this weekend! Happy Easter! Is your weather radio on the fritz? Don't worry, it's not your fault. A problem with a National Weather Service radio tower is causing weather radios in the Rockford area to go silent. In a statement from the NWS office in Chicago: "The NOAA Weather Radio station in Rockford is currently off the air to due technical difficulties. A restore time is not known at this time. We apologize for any inconvenience this may be causing." If you own a weather radio and it's not working, click here for a list of alternate NOAA Weather Radio Transmitters. Earlier this week may have been a little hard for some people with the 0.3" of snow that was recorded at the Chicago Rockford International Airport Monday evening. But look at it this way, it could be a whole lot worse! At least it's not a FOOT of snow like parts of Minnesota and northern Wisconsin have picked up in the past 24 hours! just this past Sunday. The rainfall over the weekend did help with the drier than normal conditions across parts of the Midwest. Northwest Illinois still remains a little dry, as well as parts of Wisconsin, but nothing that looks like it will worsen within the next week or so. Before last Sunday's rainfall, there were actually a few farmers out doing some tillage work in the fields and if the soil stays dry enough for the next week or so, they may even begin to do some corn planting. It was a rough start to the week, but the weather is finally getting back to normal across the Stateline. The worst of this week's weather came on Monday when accumulating snow fell for many parts of the viewing area. It wasn't much, but the 0.3" of snow Rockford received on Monday was the latest accumulating snow we've seen in a season in more than a decade! If you stayed up last night, you saw quite the show. Skies cleared just in time for a total lunar eclipse (a.k.a. Blood Moon) to be visible from the Stateline. 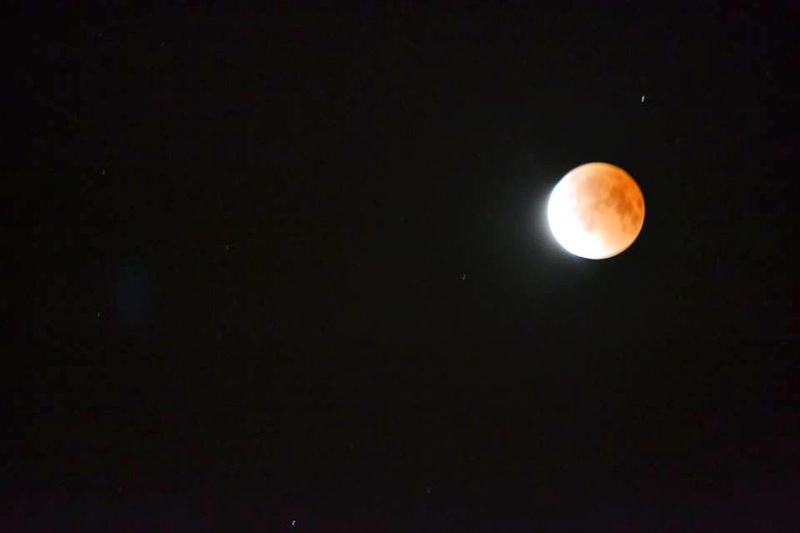 If you missed it, here are some viewer photos. There will be a few more opportunities to see a total lunar eclipse over the next year and a half. 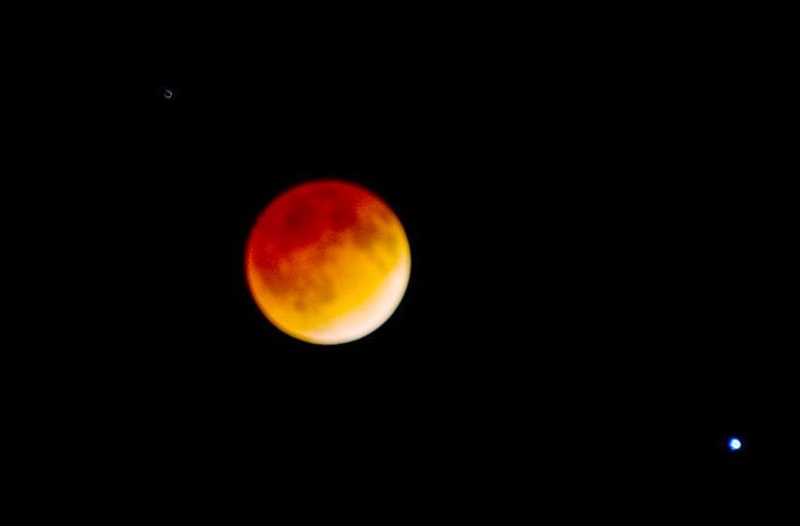 The next "Blood Moon" will take place in October with two more total eclipses scheduled for next year. 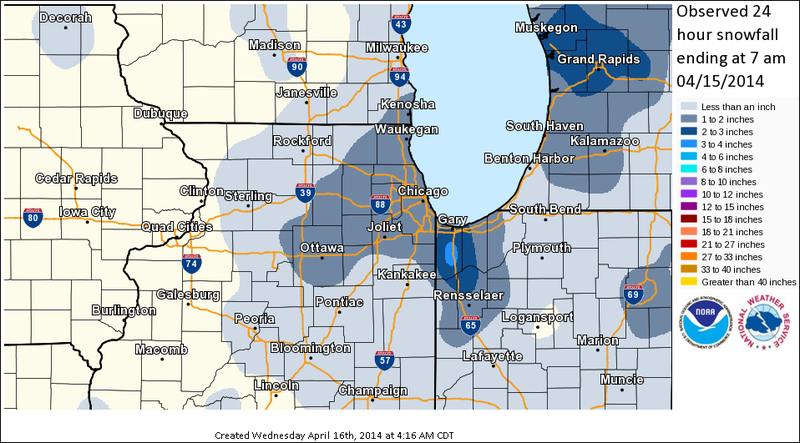 Today marked a rare occurrence for many parts of the Stateline: Accumulating snow in April. 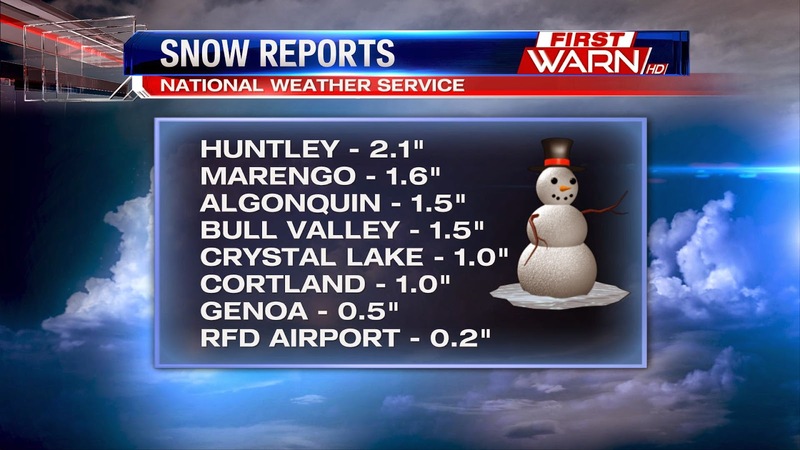 Rockford was sitting at 0.2" of snow as of 7:00pm Monday. The last time we saw accumulating snow (0.1" or more) in April was all the way back in 2009. Just like Monday, 2009 saw just enough snow to be a nuisance. If clouds clear out early enough, we'll have a nice view of a total lunar eclipse, the first of a four-eclipse cycle called a tetrad. A total lunar eclipse is also known as a "blood moon" because of its reddish color. If you're interested in staying up late, or getting up early, you'll want to look up right around midnight Tuesday morning. The eclipse will officially begin around 11:53pm when the moon begins to move near the Earth's outer shadow. At 12:58am, the partial phase of the eclipse will begin as the Earth's shadow starts to move over the face of the full moon. At approximately 2:06am the eclipse will reach totality. The earth and moon will be nearly in line around 2:46am with the light of the moon appearing at its dimmest. Eclipse totality will end at 3:24am and the moon will emerge from the umbra around 4:33am. The bigger question heading into tonight will be if the clouds clear out soon enough. At this point, it's looks like there will be some clearing taking place but I'm not anticipating complete clearing. Temperatures will also be quite cold falling into the middle and upper 20's right around midnight and dropping into the low 20's by 5am. If you do venture out and are able to get some decent pictures, send them in: weather@wtvo.com. We'd love to see them! If the clouds are too thick tonight, you can watch it LIVE from the comfort of you home here. While the Stateline has been dealing with plenty of heavy rain for our Sunday, severe weather has been affecting everywhere from Texas to Iowa, including a tornado just outside of Lone Tree, Iowa. This video comes from YouTube user ShellShock1017. You can clearly see the tornado as it passes through a farm field. 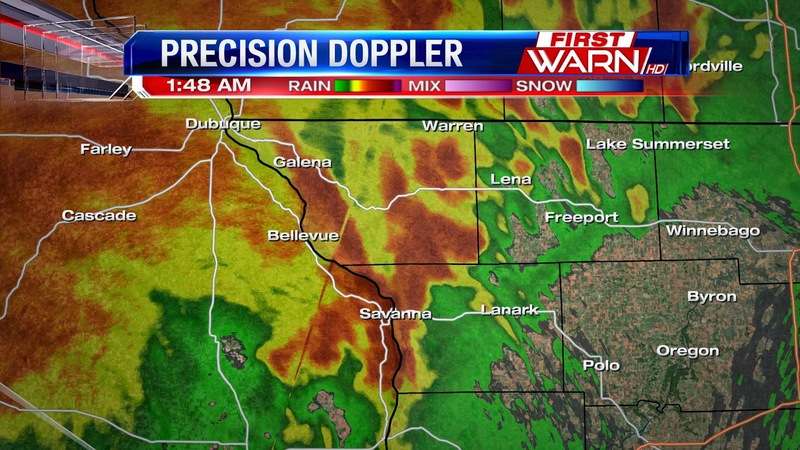 1:50am Update: Severe Thunderstorm Warning for Carroll and Whiteside counties until 2:15am. Line of thunderstorms crossing the Mississippi River will be capable of wind gusts to 60 mph and heavy downpours. SATURDAY EVENING UPDATE: Severe Thunderstorm Watch extended until 5am for the following counties: Jo Daviess, Carroll, Whiteside, Stephenson, Winnebago, Boone, Ogle, McHenry, Green, Rock and Walworth counties. 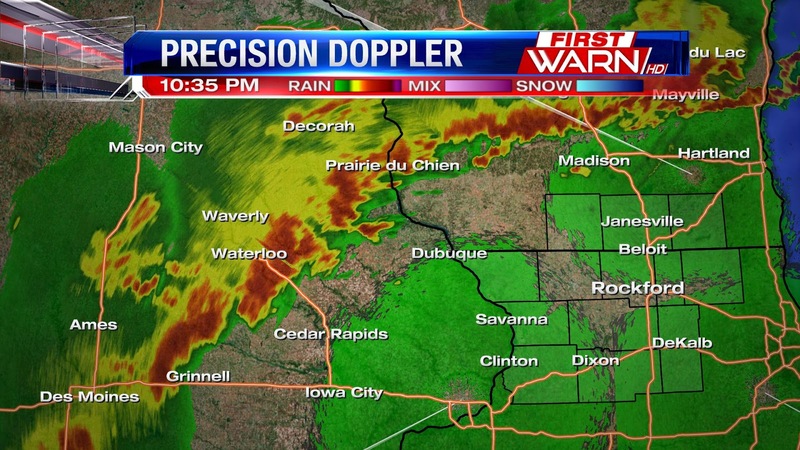 Currently tracking storms in central Iowa that are moving northeast along the warm front. This line will slowly sink east and southeast into the overnight bringing storms into northern Illinois and southern Wisconsin after midnight, likely between midnight and 2am. An interesting note with these storms is that some of the shorter term models are indicating a weakening trend of the storms in Iowa as they move east into Illinois. Will be interesting to see how they hold together. 8:00pm Update: After the large hail and strong winds that came through Saturday morning, additional thunderstorms will be likely through the overnight and into Sunday. Before we recap what happened Saturday morning, let's first discuss the set up we have going into tonight. form, they will follow the flow within the jet stream which will track them east/northeast over time. At the same time, the warm front is expected to slightly shift a little further south closer to the Wisconsin/Illinois border tonight. This will then become the focus for storm development through the overnight and possibly into Sunday morning. 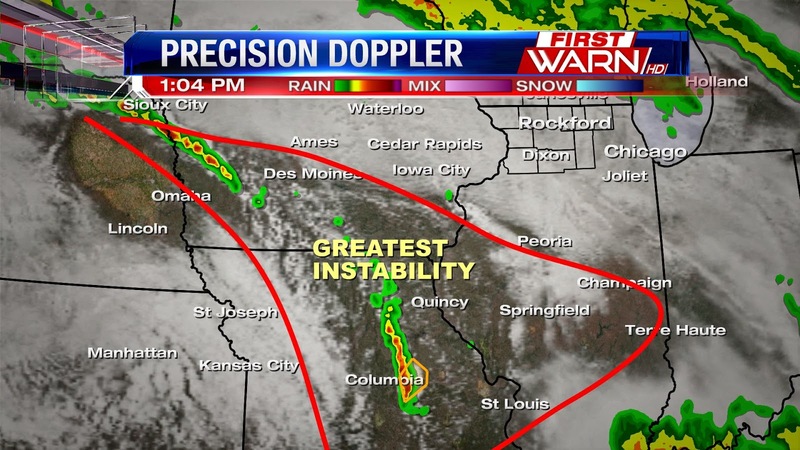 As the evening progresses, the individual storms in Iowa are expected to become organized into more of a cluster of storms rather than individual storms. This means the hail threat will decrease, but the wind and heavy rain threat will continue. Where exactly the warm front settles is where the storms will follow into tonight. The severe threat will stay a little further south on Sunday closer tied to the where the strongest winds will be in the upper levels of the atmosphere. However, thunderstorms will persist through day on Sunday and will really amp up going into Sunday evening as a cold front and low pressure slide east of the Mississippi River. Sunday is the day where we can expect the heaviest rain as winds at the surface and above flow parallel to the cold front. This means as storms form, they have the capability to move over the same location producing the heavier rain. Again, where the front lines up is where the heaviest rain will fall. Right now that looks to be in northwest Illinois and southwest Wisconsin. There, nearly the two inches of rain could fall! Now, let's look into what happened earlier Saturday morning. The low level jet, which are simply stronger winds about 3,000 to 5,000 ft above the surface, helped to develop storms in Iowa and Minnesota overnight Friday. A stationary boundary near the Wisconsin/Illinois border Saturday morning then became the energy needed for those storms to intensify as they neared Jo Daviess County. And that's exactly what they did. Pea to quarter sized hail was reported from Galena to Freeport, but as the storm tracked over Freeport it began to show signs of intensifying into a supercell thunderstorm as it moved into an environment that had a little more shear in the atmosphere. This means a change of wind direction with height. Thankfully, it remained elevated otherwise we might have had a few tornado warnings issued. Mid-level rotation within the storm strengthened producing wind gusts near 70 mph, downing trees and causing damage to many buildings around the Freeport area, likely the cause of a mini-downburst. As the storm tracked east into Winnebago County, the strong rotation continued which caused the significant hail that fell. While the majority of it was nickel to quarter sized, there were several reports of ping pong up to golf ball sized hail that fell around and east of Rockford. The storm followed along the warm front into northeast Illinois before moving out over Lake Michigan. At this point, it doesn't look like that will happen again tomorrow morning, however, we've got to watch where the warm front ends up from any overnight storms by the morning.